Parts: I. 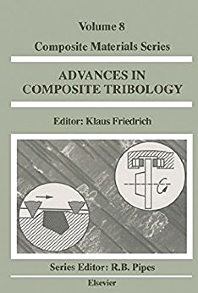 The Tribology of Composite Materials: A Preface. II. Tribology of Polymer Composites. Chapters: 2. Friction and wear of self-reinforced thermoplastics (J. Song, G.W. Ehrenstein). 3. Reciprocating dry friction and wear of short-fibre reinforced polymer composites (A. Schelling, H.H. Kausch). 4. Short-fibre reinforced, high-temperature resistant polymers for a wide field of tribological applications (A.M. Häger, M. Davies). 5. Recent developments in tribology of fibre reinforced composites with thermoplastic and thermosetting matrices (U.S. Tewari, J. Bijwe). 6. Wear models for multiphase materials and synergistic effects in polymeric hybrid composites (K. Friedrich). III. Tribology of Ceramic, Glass and Metal Matrix Composites. 7. Tribology of ceramic matrix composites against metals (K. Fukuda, M. Ueki). 8. Wear mapping for metal and ceramic matrix composites (P.K. Rohatgi et al.). 9. Performance of metal matrix composites under various tribological conditions (S. Wilson, A. Ball). 10. Tribological properties of unidirectionally oriented carbon fibre reinforced glass matrix composites (Z. Lu). 11. Friction and wear characteristics of advanced ceramic composite materials (B. Prakash). 12. Erosion of metal matrix composites (I.G. Greenfield). IV. Tribology of Composite Materials for Special Applications. 13. Tribology of composites for magnetic tape recording (H. Jacobi, U. Nowak). 14. Friction and wear of polymers, ceramics and composites in biomedical applications (G.W. Stachowiak). 15. High-speed tribology of polymer composites (I. Narisawa). 16. Tribology of composites used as frictional materials (G. Crosa, I.J.R. Baumvol). V. Tribological Response of Composites in Relation to Other Requirements. 17. Rolling contact fatigue of polymers and polymer composites (T.A. Stolarski). 18. Fretting and fretting fatigue of advanced composite laminates (K. Schulte et al.). 19. Tribological facets of polymer composites fabrication (D.R. Williams). Author index. Subject index. Much research has been carried out and a lot of progress has been made towards the use of composite materials in a wide field of tribological applications. In recent years studies have been made to determine to what degree phenomena governing the tribological performance of composites can be generalized and to consolidate interdisciplinary information for polymer-, metal- and ceramic matrix composites. The importance of promoting better knowledge in the areas of friction, lubrication and wear, in general, is demonstrated by the contents of this volume. It covers a wide range of subjects extending from fundamental research on the tribological characteristics of various multi-phase materials up to final applications of composites in wear loaded, technical components. Besides the emphasis on composites tribology, the great practical aspect of the field in many industrial applications is also reviewed by authors who are engaged in applied research as well as those in more academic activities. The articles in this volume will facilitate both researchers and mechanical designers in their work towards a set of predictive, materials engineering-related models for a more reliable use of composites as tribo-materials. Through the study of, and observation of, the tribology of sensibly formulated composite systems may emerge a clear and more profound understanding of the subject of tribology. In this sense, this book offers a major and critical evaluation of the state of understanding of the principles of tribology and its ability to serve the practical and commercial needs of this technology generally, and particularly in the context of composite systems.